This year I saw that they developed a new product called, confusingly, Pyranha Spray n' Wipe. Really guys? This was the hardest possible product to Google as a result of basically having the same name as the existing Pyranha. Anyway, Spray n' Wipe shall be referred to as "Blue Pyranha" from now on and Wipe n' Spray will be referred to as "Yellow Pyranha". Blue Pyranha is 'new' although I have no idea how long it's been out. I got a trial bottle of it as a freebie at a horse show last fall, so at least that long. They tout the fact that it's water-based above everything else, since I guess a lot of people don't like that about Yellow Pyranha. The oil-based formula does attract dust and leave a sheen on the barn floor when I'm done with it. What caught my eye, though, is that this one wards off a broader range of insects than Yellow Pyranha, including ticks. Not shown on this label, but it does say ticks elsewhere on the bottle. I've seen enough people and horses with lyme disease to know I want to avoid it at all costs. And yeah, fly sprays aren't a magic flyproof bubble, but it's something. I've been using it now for this entire season (halfway through already, can you believe it? I'll be clipping in just over three months!) and I actually haven't seen a single tick on Connor this year. So...it's working? One way or another, it's just as effective as Yellow Pyranha at flies, so I'll keep using it. It also definitely doesn't attract dust or leave a sheen on the barn floor like Yellow Pyranha. That's four refills for $49.95 at Riding Warehouse, or $12.48 a bottle. If you're smart, unlike me, and didn't order it days before RW's 15% off sale, you could've gotten it for $42.46 or $10.60 a bottle. 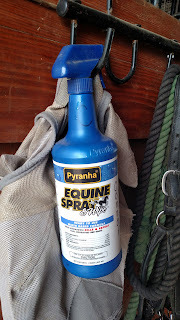 It also comes in a tiny trail size bottle size that's designed to be dropped in a saddle bag and applied on the trail. For me, Yellow Pyranha is officially out and Blue Pyranha is officially in! Has anyone else tried it yet? 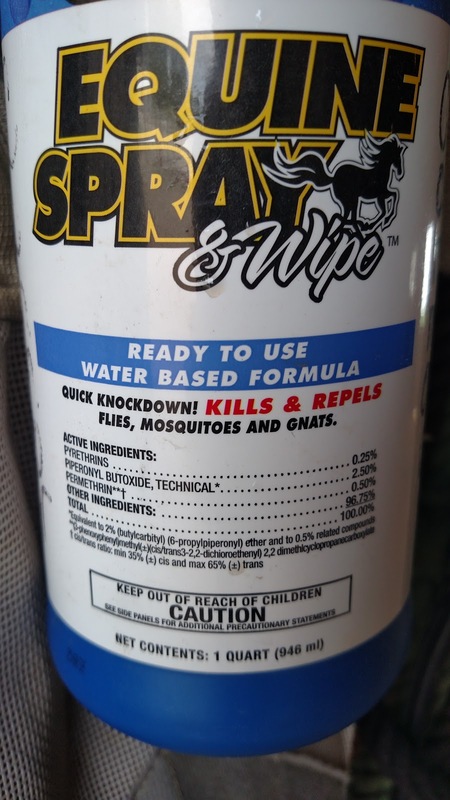 What's your current favorite fly spray? This I would consider using. I hate the oil based spray because I live in a desert and my whole world is dust, so there isn't even the minute of "ooooo shiny". It's just straight to gross. I can imagine that out there. You'll definitely like this stuff. Interesting. I don't think I've ever seen either of the Pyranhas but I may need to keep an eye out now. My go to fly spray is Absorbine UltraShield EX. It's the one most easily available in the local tack store, but it also works well for me. My favorite feature is the spray bottle. They redesigned the bottle a few years ago and now it has the perfect spray. I get so annoyed with bottles that squirt big drops in some places and leave other areas dry. The Absorbine has a nice steady mist that I appreciate. I've seen a lot of people use that one. I haven't myself, but I felt like with that continuous sprayer it wouldn't last as long. No personal experience though. That is good to know since I just noticed the blue bottle on Valley Vet. We used to use the yellow, but the cost went up too high for the number of horses we have. So I went to Zonk It which we mix with vinegar and we also use Natures Defense for light bug days. Haven't heard of either one of those but I bet you really go through it with that many horses. 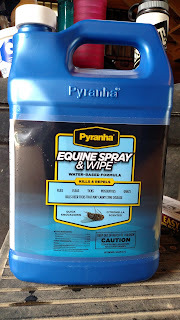 I've been using the ecovet fly spray and whatever i can find at other barns. 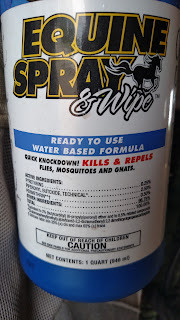 I hate how expensive fly spray can be! Me too! That's why I sprang for the gallon. $10.60 a bottle is about the cheapest I can get. And no I will not use Bronco to save $$. Haha. I think the flies laugh when they see it coming. Tractor Supply always has either the blue or the yellow spray on sale so I just grab whichever is cheaper that day. I really like them both. I have seen ZERO ticks on my horses this year until this past weekend! I found three on Moe, so once I run out of the Absorbine Bug Block, I'll pick up a bottle of this. I mean, it's great that the Bug Block works on scorpions and black widow spiders (WTF), but I think I'd rather it work on ticks, haha! Very interesting! Now I really want to try this! I have both the yellow and the blue and I like them both. did you have to reapply either, more than the other, while out? As a boarder that lives almost an hour away from the barn, I'm really not equipped to answer that question, unfortunately. I put it on him when I'm there a few times a week, and the barn staff sprays him before he goes out for the day.